At DLE, we know that “we don’t know what we don’t know”. We are aware we will never know your business as you do. Our role is to listen to all the relevant voices then make them come to life through impactful, thoughtful design. Our hearts and minds are open. We hear – we listen – we don’t leave anyone behind. It’s a true ‘co-creation’ approach that motivates us to do our best work. Not only does it reward us personally, but it creates an environment of trust and respect that is the foundation of our long term relationships. We wander the world looking for new ideas and intriguing approaches. Our research is observational in nature. That’s what we do. We watch. We are curious. We look to find new trends and unique ways they show up in the communities you serve. Okay, we have been at this a long time and some things become second nature. Days, weeks, months, and years of idea after idea imbue our collective sensibility. This has enabled our advantage to quickly pick up on the right solutions to design challenges in new and different ways. We are collaborative by nature. In fact we believe that everything is better through co-creation it reflects our deepest held values. Being open. Purposeful. Collaborative with our clients. Co-creating with our clients and partners is not only the path to the optimal solutions it’s the most rewarding approach for us as well. We root out different options and let the ideas flow. Each element we design, build, or install is done with purpose. We think about brand, the customer, the community. Every brand has a story. Every customer has a story. Every community has a story. When we design, we design their story into the space, creating meaningful connections between our client’s brands, the customer’s community, and the customer. With purpose and story comes style. 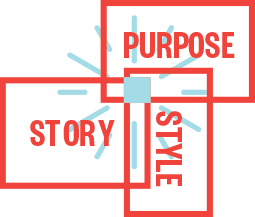 Style decisions we make are meant to bring the purpose of the brand and the story of the customer/community to life.